Dissolve ¼ cup of table salt in 4 cups of cold water in a zip lock bag and add the pork chops to the brine and refrigerate for 30 minutes. Remove after 30 minutes rinse and pat dry with paper towel and set aside at room temperature while preparing the breading. 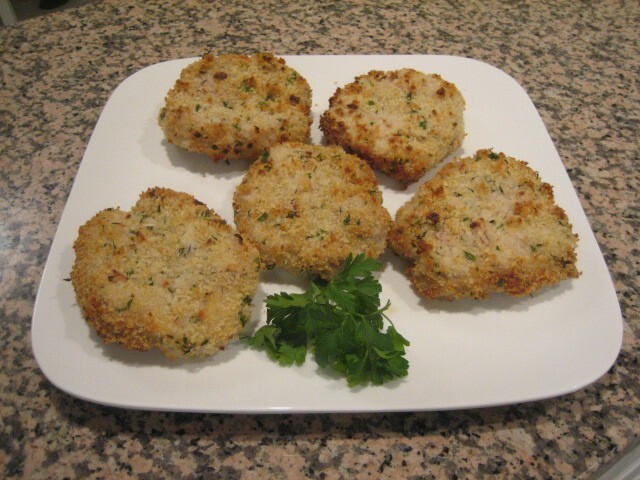 In a medium bowl combine the panko bread crumbs, shallots, garlic, kosher salt, pepper, and the olive oil. Combine with a fork until there is an even coat of oil over the mixture. Then in the same bowl add the parmesan cheese, parsley and thyme and stir into the panko bread crumb mixture to combine. Next prepare a three dish assembly line. In the first dish add 1 cup of flour. In the next dish add the whisked egg whites, mustard and the remaining 6 Tbs of flour. This batter mixture will be a little lumpy but whisk it until only pea sized lumps remain. In the last dish will be the medium bowl with the panko bread crumb mixture. At the end of the assembly line place a sheet pan lined with an oven proof wire rack. Spray the wire rack with cooking spay to prevent sticking as the pork chops will be cooked on the wire racks. Take the first pork chop and coat in the flour and shake off any excess flour. Then dip in the batter mixture and then press firmly into the breadcrumb mixture and shake off any excess. Place the coated pork chop on the wire rack and repeat with the remaining chops. 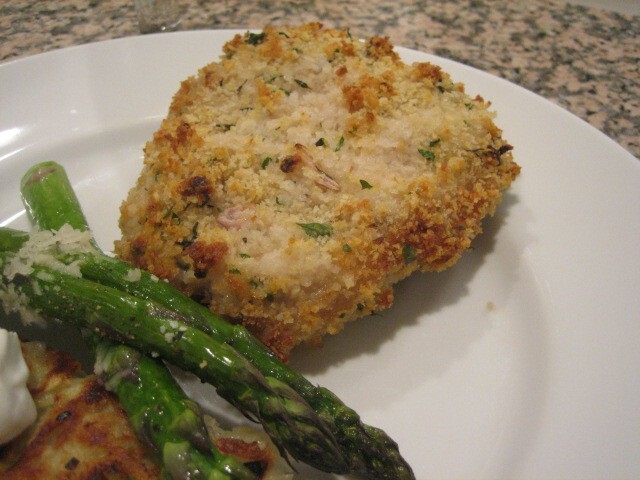 Bake the breaded pork chops in the oven for about 20-30 minutes or until the internal temperature of the center of the pork chop registers between 140-145 degrees F then remove from the oven and let rest for 5 minutes.